Freshly made. Leftovers. Freshly warmed. Who cares? On a toothpick. Or by hand. By the dozen. Or half-dozen, belying your generosity. Not showing your greed. A half-dozen, at the very least. But one by one. One after the other. Hard flesh, rubbery flesh, crunch. Juicy tentacles. With rice. Delicious, freshly-boiled white rice. And plantains. Simply fried. Not stuffed or peppered. Peppered and spiced. No garlic butter. Just yet. By hand. Forget cutlery. And decorum. You’d be hard pressed to find many things France and Nigeria have in common. Apart from me, of course – sworn allegiance to most things Francais and very Nigerian. Think garlic butter and perhaps it might become clearer. I know I’m being silly for the very title gives me away. Snails. L’Escargot. Of differing provenances and sizes but land snails nevertheless. 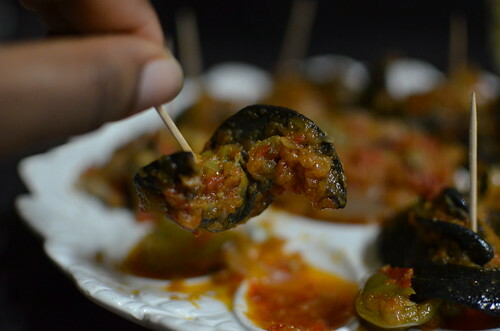 The Japanese, Vietnamese and Chinese also eat some varieties of snails, from sea to land. I love snails. I don’t forbid them. Thankfully. Like some people in southern Nigeria do. I have no idea why they are called Congo meat, despite my trying…..via google but I’ll keep at it. My kids are afraid of them. One daughter holds them feet away. The other refuses to touch them at all. If they grow up in Nigeria, Nigerian…..they’ll understand them. With time. In time. 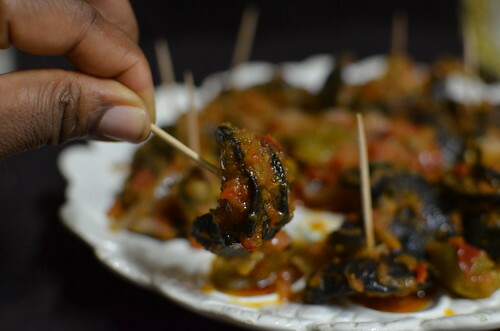 For snails in Nigeria are as much a delicacy as they are in France. 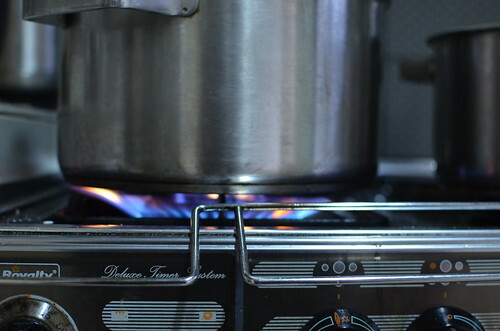 They are coveted, prized, relatively expensive in restaurants, and rarely a daily ‘eat’. Nigerian snails are comparatively large. Huge! One could nestle in the palm of my hands, comfortably and not sharing space with another. The English interpretation is that snails have the natural tendency to walk on thorns without any fear of harm or molestation. …the real Igbo wise saying and moral means that: One can win or solve difficult problems or win through any odds by imitating the gentle manners of snails; or by … being honest, truthful, and gentle but not by being arrogant, proud, boastful or antagonistic! 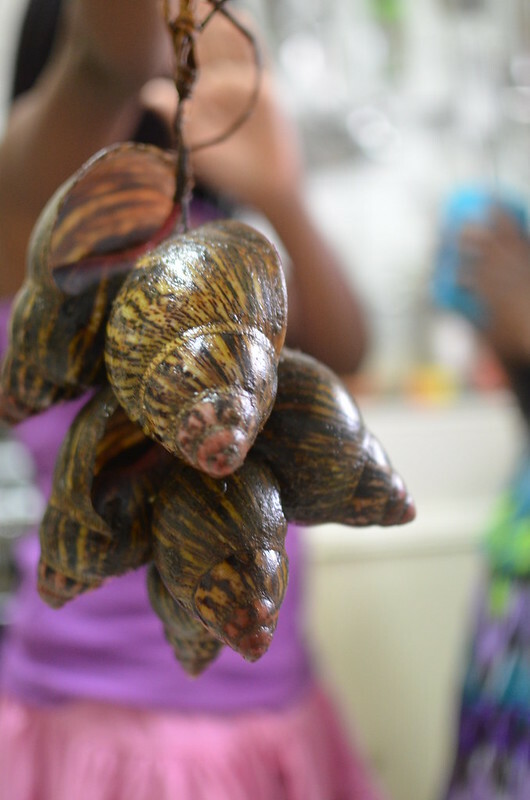 In Nigeria, snails are cheaper in the wet season than in the dry, and are commonly sold in ‘bunches’. The shells have small holes bored into them, and a group of 5, 6, 7 or more snails is then strung up together. This makes it easy for the seller to hold out multiple ‘bunches’ and dispense with them, as and when a purchase is made. It is interesting that around the world, snails are considered to be amongst the top invasive species due to their rapid reproduction rate and the sheer number of offspring they produce. I guess this is one case of Nigeria’s population and land area standing in the gap and keeping the snails at bay because we don’t seem to suffer from an invasion! Speculation on my part :-). Of course. And though I loveeeee snails, they require some processing before they are ready to eat. The good news is that each step is easy and the whole process can be broken up into ‘core tasks’ of Step 1 & 2, then perhaps 3, followed by 4. The choice is yours. There are two ways I know how to remove snails from their shells: one easy…..and the other effective. The first method involves a hot water soak, which lubricates the interior of the shells and enables snails to easily slip out. My father never liked this method, devoid as it is of the slime and grime of snails because it ‘softens’ the meat. 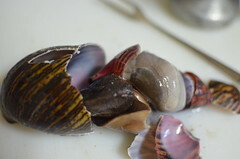 This method however, keeps the shells intact, and available for future ‘decoration’ opportunities. 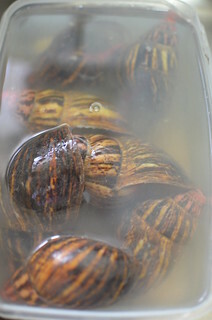 Soak the snails in a bath of hot, just-boiled water. 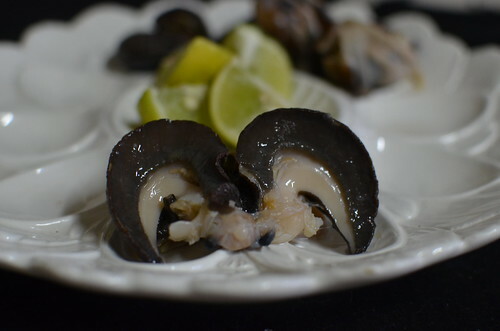 Let them sit for a few minutes, then using (2-pronged) forks, pierce the meat protruding from the largest part of the shell and pull the snail out. The second method is to crack the shell, using a mallet or a stone, as the market women do. 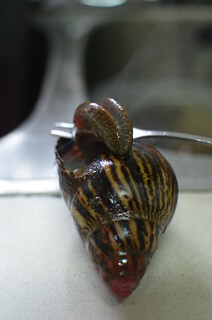 Both methods expose the entire snail, parts of which are not prized for eating. 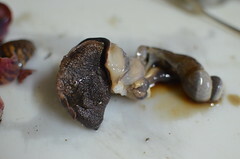 Above the feet of the snail is a light grey sac, which occupies the spiral area up to the tip. It is full of fluid and the snail’s guts. 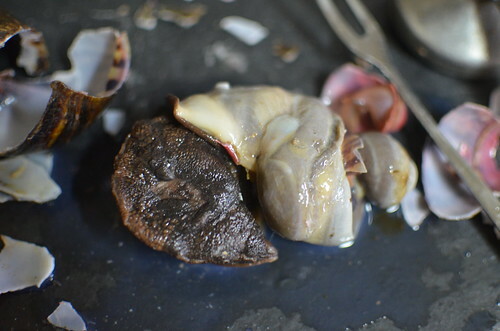 This is removed by gripping the sac, where it connects to the foot and pulling it clean to reveal two tentacles which are juicy and delicious when cooked. The final step is to split the foot open, along a natural line, using a small sharp knife. This opens up to reveal some white flesh. And create a ‘butterflied snail’. Some people prefer to use lime when cleaning snails, others use alum. And thanks to a comment left by Dee/Calabar Hottie, I can add salt and garri as an additional cleaning method! In 1980 a Chilean family established a snail farm with the intention of exporting snails to Europe for gastronomic purposes. But the family discovered that when handling the snails, the skin on the farmer’s hands became extremely soft. Injuries and cuts caused by the sharp snail cages healed quickly without becoming infected and didn’t leave scars. As snails can regenerate their own shell when diseased or damaged in the wild, it was soon realized that what restores a snail’s shell could also repair human skin. 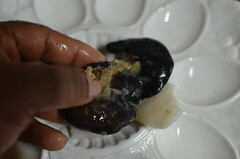 Cleaning snails with alum is the most common method in Nigeria. She says without blinking a single eye! 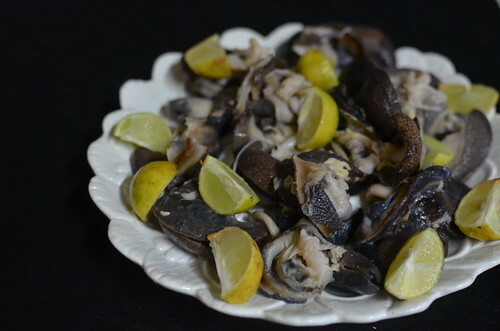 Alum, as used in preparing snails is hydrated potassium aluminium sulfate (potassium alum) – a solid, crystalline chemical with astringent qualities and the ability to cut through grease and slime. 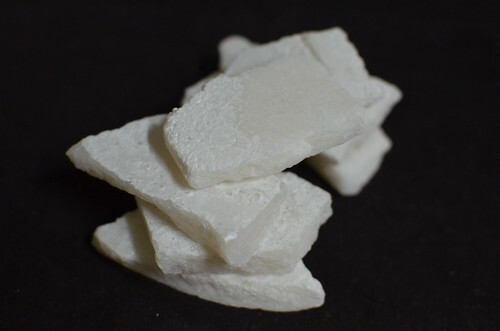 And is also used in the cosmetic industry to stop bleeding when nicks and small cuts occur, and as a deodorant! I believe it is the most effective solution when it comes to cleaning snails, not to mention how common and inexpensive it is. 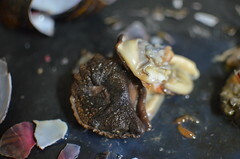 To clean snails, you begin by rubbing the alum over the snail – on the outside, and the inside, where it was opened up. It is important to massage every inch of the snail, especially the ‘hinges’, on the outside of the snail (where my thumb and index finger are in the photo on the left). That part of the snail acts as a pool, trapping slime so one has to ensure it is properly cleaned. Once you are done cleaning with alum, rinse off the snails under a cold tap and check for residual slime. 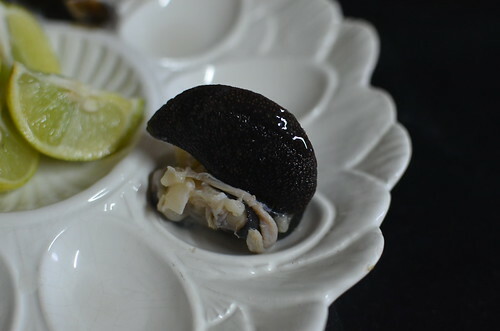 You should feel the snail’s texture and no hints of smoothness. Where alum is not available, it is possible to use limes/lime juice with their high acidity or vinegar. This works on the same principle as when used to cut grease. Though I enjoy the light, refreshing citrus fragrance when using limes, I have to admit my limited success in using it as a cleaning agent. Put it down to my impatience. It works the same way as alum – using lime quarters, and juice, rub the snails with the aim of removing all the slime off the snails. It is quite possible to end up with ‘strings’ of slime, with superb adhesive qualities! Once the snails are clean, give them a final rinse and then proceed with cooking, or storing. They will keep refrigerated for a couple of days but I prefer to freeze them if I’m not ready to cook. To freeze, place them on a greaseproof-lined baking sheet till frozen hard, then remove and place individually frozen snails in a freezer-safe food bag or container. Freeze till required. 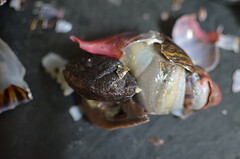 Dee writes: ‘…… I’m usually a snail fan, however the process required ‘no be am’ and I don’t get the quality I have been spoilt with growing up when I purchase outside. There is a method of cleaning snails that you did not talk about however and I’m almost certain the second half of it would help to cut the slime and clean the snail the way alum does in your lime method. My mum never used alum because quick as it was, she had found that the crunch was always compromised. She however taught us to wash with salt. 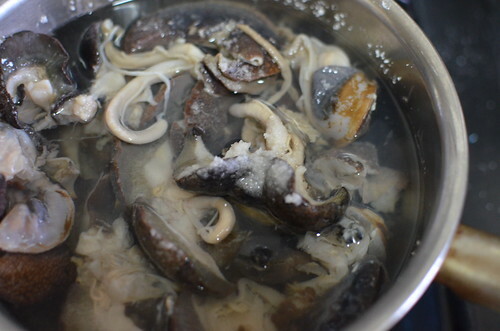 Salt is sprinkled all over the snail and used to scrub the snail bodies. I must add, that the slime it produces is second to none. She would do this no less than 3 times and sometimes up to 5 times. When she was satisfied that the body was smooth and the slime was not as dark yellow as when she had begun she would then use garri for the second step. 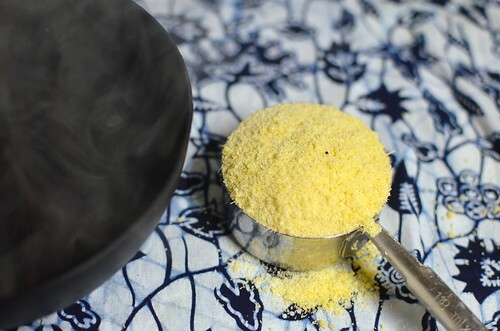 Garri (also known as gari, garry, or tapioca) is a popular West African food made from cassava tubers. The spelling ‘garri’ is mainly used in Nigeria, Cameroon, Sierra Leone…. 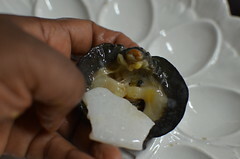 The garri would be used to cut the slime and clean up the snail. She would do this roughly 3 times, wash and check for slime. If the slime had not ‘cut’ to her satisfaction she would give it a once over. It does sound tedious, …however the crunch never lied. I take this first step when cooking my snails. 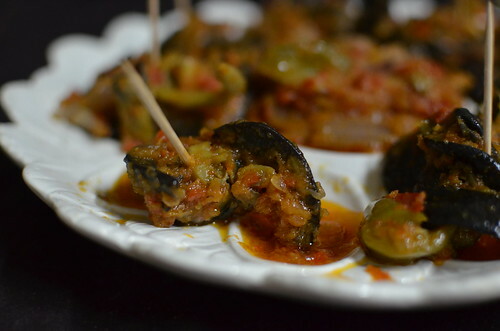 The essence is to cook the snails, prior to frying and saucing in a chunky tomato-chili mixture, which complements the chewy, rubbery texture of the meat. To do this, I simply boil my snails for about 15 minutes. 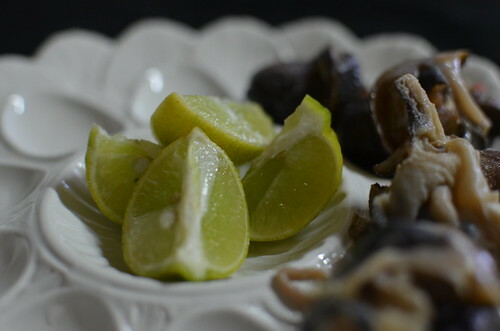 For 20 medium–sized snails, I used a small pot and seasoned the meat with 2 teaspoons of regualr salt and ½ a red onion, sliced. 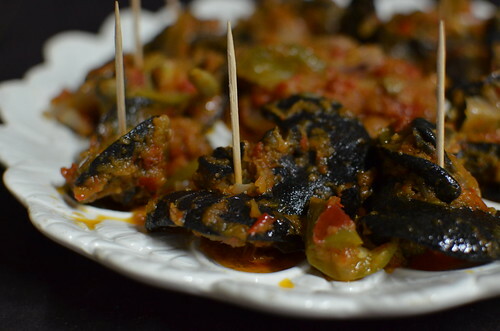 This step is based on the same sauce as in my giz-dodo recipe – a chunky blend of tomatoes, onions and chili peppers which add texture and flavour to the snails. To begin with, I slice (not finely) a red onion, and fry it off in a healthy amount of oil – about 4 tablespoons of canola or any vegetable oil. After a few minutes, I add the snails and allow them to ‘fry’ for 5 minutes. My version of ‘frying’ is not at all aggressive, yielding a tender but chewy snail. 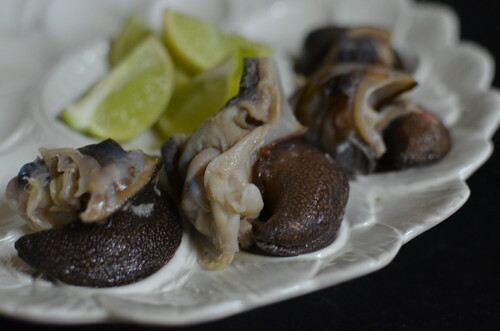 I have had deep-fried snails, cooked to the point where they become ‘leather’. 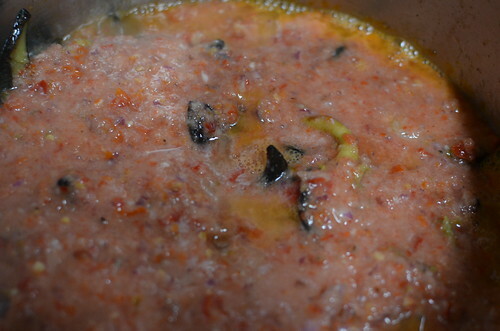 After a few minutes, I add the chunky blend of 8 tomatoes, 3 small red onions and a mix of chili peppers. This should of course be done to taste. 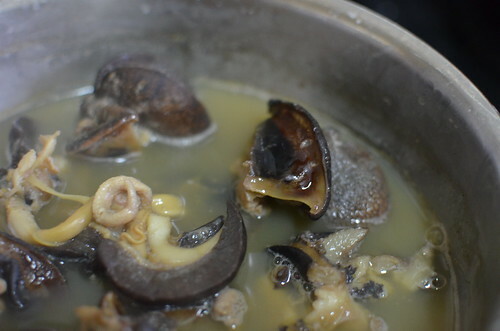 The key is to keep the mixture chunky so it cooks faster, and cooks down into a sauce that coats the snails. My spices go in – curry powder, dried thyme, ginger and garlic powders too. And a bit of stock, or some of the cooking liquid. Exactly like the giz-dodo recipe. 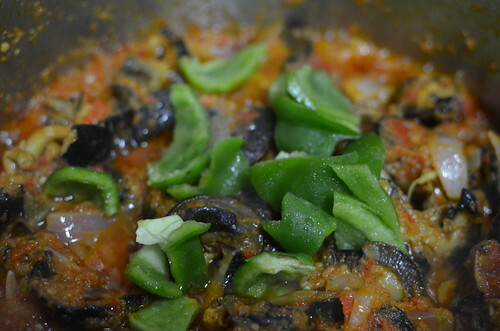 I set the pot on a medium to high heat, lid off to allow the sauce reduce, and the snails absorb some of the flavours. 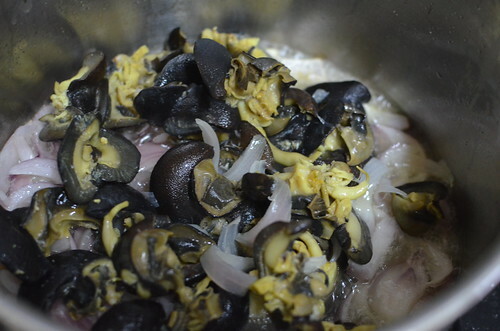 15, 20 minutes later, with lots of stirring and keen eyes, my snails are cooked. Oh, did I mention tasting along the way? To check for doneness. Of course!!!! I toss in a handful of chopped green bell pepper, and take the pot off the heat. I stir this through and the snails are ready for service. Hot, spicy, sweet and peppery. Chewy too. All textures, very much welcomed. There are few greater pairings than white rice, which for me works as the cooling agent, as do the sweet plantains. Perfect harmony. Truth be told, they also make a great bar snack on their own. I dare say some would add ‘with a bottle of beer’. But not me. I’m content with water. Or a coke. 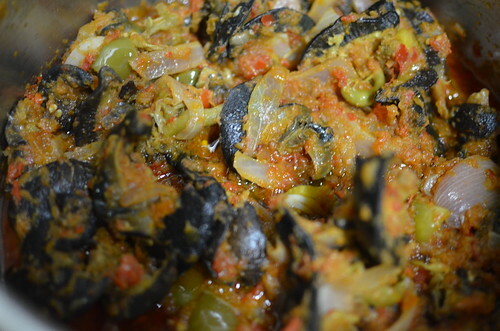 There you have it – a true Nigerian delicacy – snails. 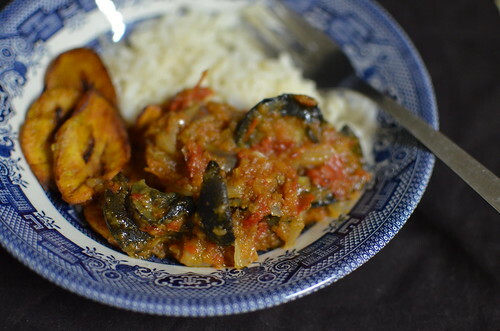 Have you ever come across snails on a plate: in Nigeria or France? What did you think of it? Would you be willing to try them? I have it in my plan to cook them French-style….soon!! Why Do We [Nigerians] Call Snails Congo Meat?